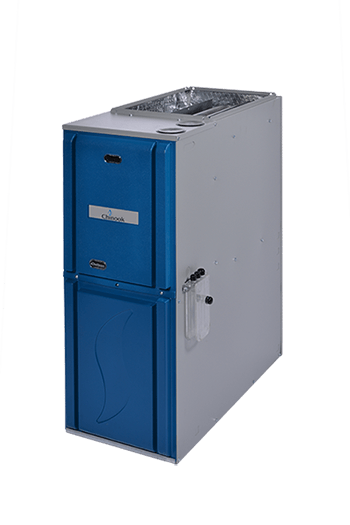 The Chinook gas furnace offers the smallest footprint of all the industry. It comes in a variety of powers from 15,000 to 120,000BTU. This range of power allows to adequately answer to new constructions’ needs while offering appliances to the replacement market. Dettson is the first and only manufacturer of modulating furnaces with 15 kBTU and 30kBTUs. Dettson is also proud to launch a new solution for the multi-family segment that is the Chinook Compact. This unit of 15,000 BTU is the most compact appliance for gas central heating. Modulating, the cream of comfort, because it is designed with a control enabling variable speed operation of its fan, as well as modulation of its gas valve. The Modulating Chinook can also be combined with the Alizé cooling unit, offering an unmatched comfort 12 months a year and access to the Right-Sized System®, exclusive to Dettson. Moreover, the Chinook family can also be powered by propane, a simple conversion kit is necessary and must be provided at the time of purchase.